Independent ventilation and air conditioning specialists established in 1996. We specialise in the design, manufacture and installation of kitchen canopy and air ventilation systems. We have the experience and expertise to offer a wide range of top quality services to customers in the private and commercial sector. Call us today for Air Conditioning in Hampshire! 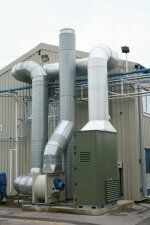 We work with clients from both Private and Commercial sectors, and offer a complete, comprehensive approach to all your ventilation needs. We are well known for reliability, honesty, professionalism and above all an excellent standard of workmanship.